Who knew that Harry Potter star Daniel Radcliffe was a Hip Hop lover and a fan of Slim Shady? Well below I have an exclusive performance from Daniel below on the Jimmy Fallon show doing Alphabet Aerobics called "Blackalicious, which is a tongue twisting rendition of the ABC's. This is amazeballs and definitely worth a look. 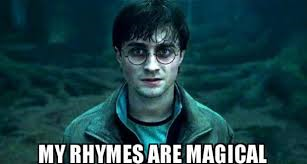 Check out Harry Potter get down on the rap tip.